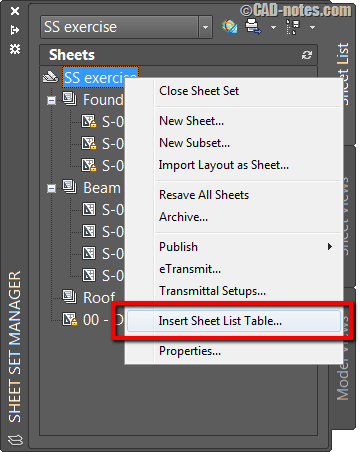 AutoCAD has Sheet Set feature since version 2005. Yes, it’s been that long. More than 10 years already! But still not many people use it. Sheet Set can be very useful, it gives more benefits than using regular layout. 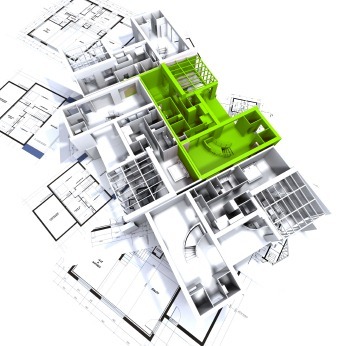 By using layout alone, we can get many benefits (read: 10 Reasons to Use AutoCAD Layout). You can get more benefits by implementing Sheet Set in your workflow. Let’s see what Sheet Set offers. Sheet Set works like folders in Windows. But instead of managing files, it manages your sheets. You can create Subsets under the main Sheet Set. You can create Subset under a Subset if you need to classify the drawing further. This is how Sheet Set looks in Sheet Set Manager. This probably doesn’t feel significant. But there are many benefits of managing the drawings in Sheet Sets. We will see them in the next point. You can use publish command without using Sheet Set Manager. However, if you manage the drawings in Sheet Set properly you can publish multiple drawings faster. You can choose to publish the whole drawings in the whole Sheet Set. Or if you want to publish only architectural drawings, you can publish drawings in a Subset. You certainly can save the sheet list in Publish command. But as the project grows, you also need to update the drawing list regularly. You don’t have to do that if you use Sheet Set. The drawing list in Sheet Set will also grow if you use it. eTransmit is a great tool to pack and send your drawings. Similar to publish command, you can use this tool separately. However, accessing this tool from Sheet Set Manager will add the drawings quickly than add the drawing individually to eTransmit. You can pack and send (or backup) all drawings in your project with all dependent files quickly. If you have to change the drawing information, you only need to do it once. The value will be updated in all sheets. This will reduce time and error when creating your drawings. You can create drawing list from Sheet Set easily. Similar to the other tools, you can create sheet list from the whole Sheet Set or just a specific Subset. Not only the drawing number and drawing name, you can include all necessary properties like drawn by, check by and approved by like below. Sheet Set doesn’t just manage sheets. It also recognize your views in model and sheets. 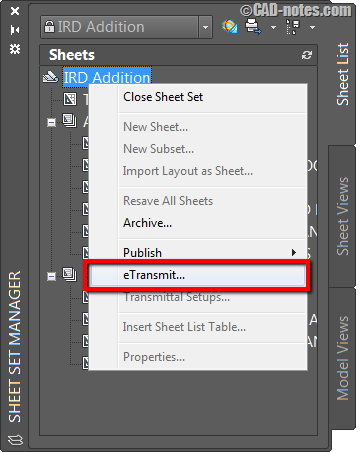 When you place your views using Sheet Set in sheet (if you are confused, we used to call it layout) AutoCAD will also filled view title with information. In this example, AutoCAD will fill the sheet number, drawing name and drawing scale automatically. You need to input the drawing number manually, but AutoCAD has done the most work! You can add callout to refer to other drawing in Sheet Set. If you guess Sheet Set Manager will fill the information automatically, you are right. The drawing number and sheet number where the detailed drawing is placed, shown in the callout bubble. To get all the benefits, you need to learn and prepare several things. 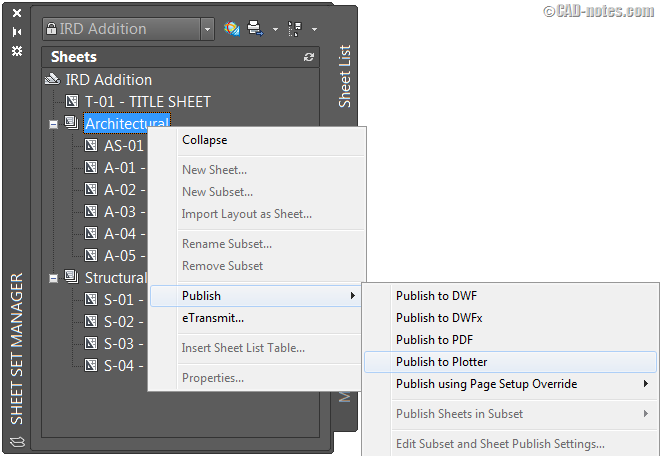 You need to create title block, view title and callout to retrieve the information from Sheet Set. You need to create Sheet Set with custom properties. 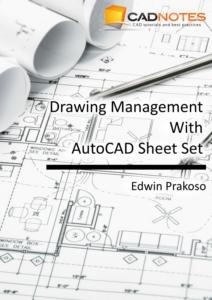 If you are interested to learn more about using Sheet Set in AutoCAD, check our e-book here: https://www.cad-notes.com/sheet-set-manager-book/. It has free chapter to try the Sheet Set benefits as described above. Download the sample chapter here. We use the sheet set all the time! I have the scale in SSM set up so it will change on individual sheets (Via Custom Field, but would like to know if there is any way to set a subset so you could change all the scales of the sheet in that subset? I do have a scale in the Main SSM, but we do not like to use that since it would change all sheets. I use the sheet set all the time but a problem I have is when I send drawing to client who has no experience with the sheet set. They always loose the reference to sheet view and sheet number because they move the drawing from one folder to another etc.. Right now I have to manually burst every callout block and view label which is time consuming, do you have a better idea to do this? I don’t think there’s a way to fix it. Can’t you just ask them not to change the files location and folder hierarchy? Thanks for the vivid explanation! 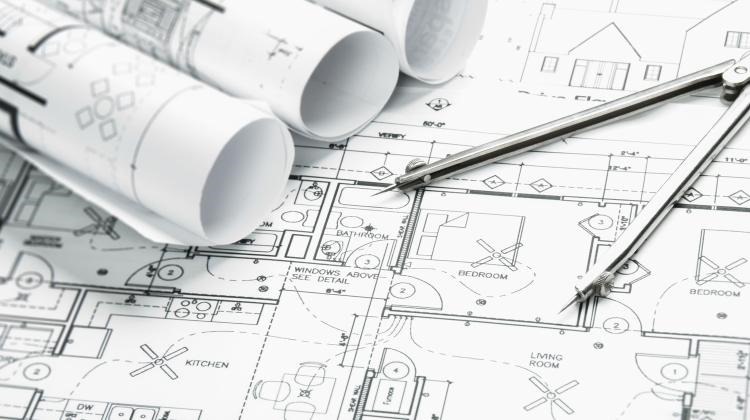 This blog is always my destination to expand my knowledge about Autocad. My download of SSM Exercise to go with the book is missing the Roof drawing. That points out that one missing drawing disables the “publish” option completely. So where do I get the missing drawing? Can you tell me in what page of the instruction is missing? You can also try to publish your the exercise after you finish the tutorial. It’s a really excellent book. I’d like to recommend it to a client I’ll be rolling into SSM for design/production. They’d need a multi-user set of the book. 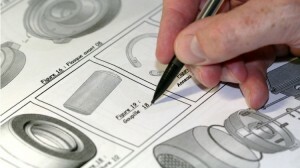 Is there a company break for engineering department training use? Thanks for letting me know about the missing drawing. And I’m glad that you like it! I can give special price for them. How many users will use the e-book? Send me an email to edwin.prakoso@cad-notes.com. 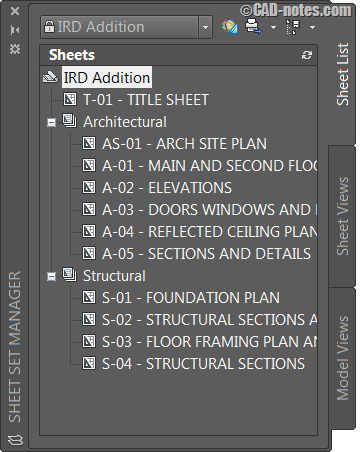 I feel the sheet sets would be a more useful tool if it was integrated into project manager on the expanded version of AutoCAD. Otherwise I need to manage two sets of drawing/sheet tools when working on projects in AutoCAD Electrical and other products that use project manager. #8 – you can reuse that .DST file over and over as a template and never have to make up custom fields again.